FBackup Free Download 8.0 Build 122 [Latest] - Is Here! 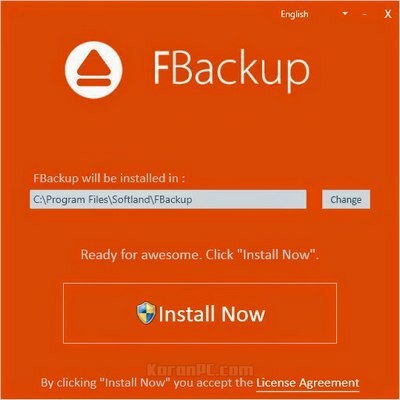 HomeBackup & RecoveryFBackup Free Download 8.0 Build 122 [Latest] – Is Here! Fbackup available for free download from our software library. Sometimes this is unavoidable, and your computer needs a hard disk format, or, even worse, you are faced with a hardware failure. In order not to lose all data collection, you should start creating backup copies. FBackup is an application designed to back up your personal files and protect them. They can be stored on hard drives or in a local network. Having access to the "Properties" of the application, you can also save your files to an external hard drive or removable device. FBackup allows you to create a complete copy or just a mirror for your files. In addition, you can encrypt data and add a password. This means that only you restore your backups. • You define a backup job, set it up for automatic execution, and forget about it. FBackup will automatically start backing up on a scheduled date, so you not only protect your data, but also save valuable time. • When using a full backup type, sources will be archived using standard zip compression. FBackup uses ZIP64 compression, which means that it can create zip files larger than 2 GB. In addition, you can protect the zip file by requiring a password to extract data from it. • If you do not want the files to be stored in a single zip file, FBackup can make exact copies of backup sources. Since FBackup will also back up empty folders, you can use this type of backup to create a “mirror” copy of the source files at the destination. • For each backup job, you can define an action to be performed before or after the backup. For example, you can set the “Clean Backup” action before starting a backup so that all previous backups are cleaned before loading new ones. As an action after a backup, you can set it to standby, log out, sleep, or even shut down your computer after successfully completing the backup. • The two main functions of the backup program are backup and restore operations. FBackup makes them easy for you by offering friendly wizards. You start a new backup wizard, choose what, where, how and when to backup, and the backup is ready to run. If you need to recover files, you will open the recovery wizard, and it will ask you where you want to recover the files. • FBackup automatically checks for updates weekly, so you know when a new version will be released. The option to check for updates can be disabled, but we recommend that you enable it so that the FBackup update is up to date. • Multiple backup locations. By default, the location of your backups is the local Windows partition. To ensure reliable backups, you need to store backups at other destinations supported by FBackup (for example, on an external USB / Firewire disk or on a connected network drive). That way, if your computer crashes, your data will be stored in a safe place. • You can load plug-ins to back up or restore settings for certain programs or other user data (such as saving games, email data, etc.). After downloading to FBackup, these plugins will add to the list of "Predefined backups" the sources necessary for the backup for this particular program. • If the file is used by another program during backup, FBackup can still back up this file because it uses the shadow volume service provided by Windows. Iperius Backup Full 6.0.1 Free Download – Is Here! Acronis True Image ISO Bootable USB 2019 – Is Here! Macrorit Disk Partition Expert 5.3.9 Full + Portable – Is Here! CompanionLink Professional 8.0.8032 Free Download – Is Here!